Teachers STEMing Out! Lessons Learned from a University and K-12 Educator Collaboration Presented By David H. Khaliqi, M.A. Center for STEM Education Also, Peter D. Marle and Lisa L. Decker Teachers STEMing Out! 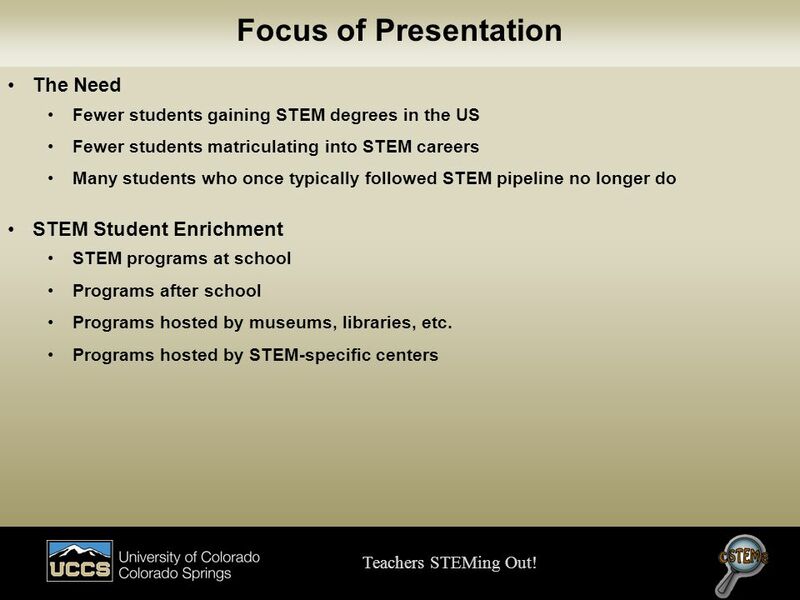 Fewer students gaining STEM degrees in the US Fewer students matriculating into STEM careers Many students who once typically followed STEM pipeline no longer do STEM Student Enrichment STEM programs at school Programs after school Programs hosted by museums, libraries, etc. 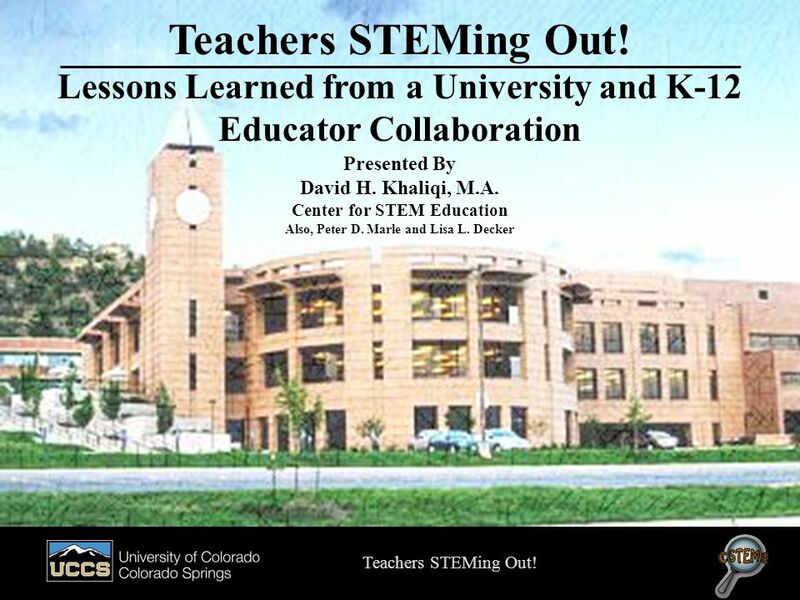 Programs hosted by STEM-specific centers Teachers STEMing Out! 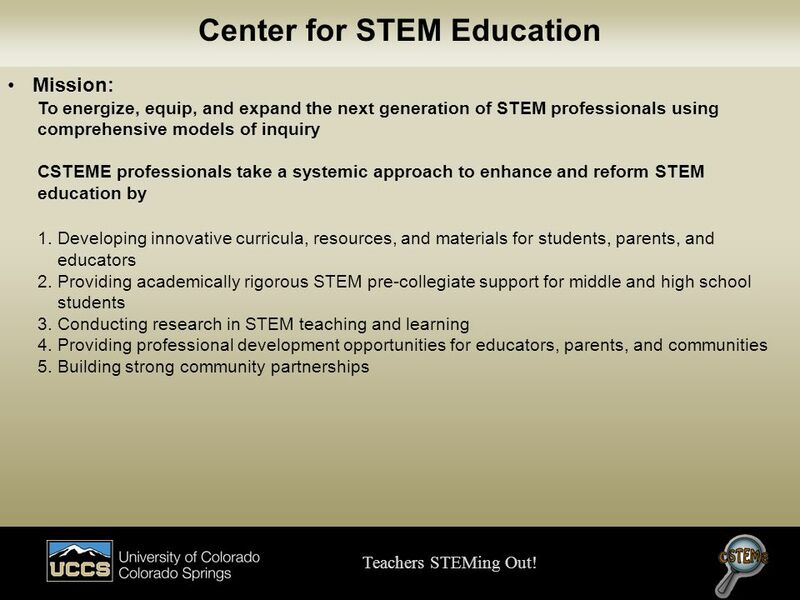 Mission: To energize, equip, and expand the next generation of STEM professionals using comprehensive models of inquiry CSTEME professionals take a systemic approach to enhance and reform STEM education by Developing innovative curricula, resources, and materials for students, parents, and educators Providing academically rigorous STEM pre-collegiate support for middle and high school students Conducting research in STEM teaching and learning Providing professional development opportunities for educators, parents, and communities Building strong community partnerships Teachers STEMing Out! 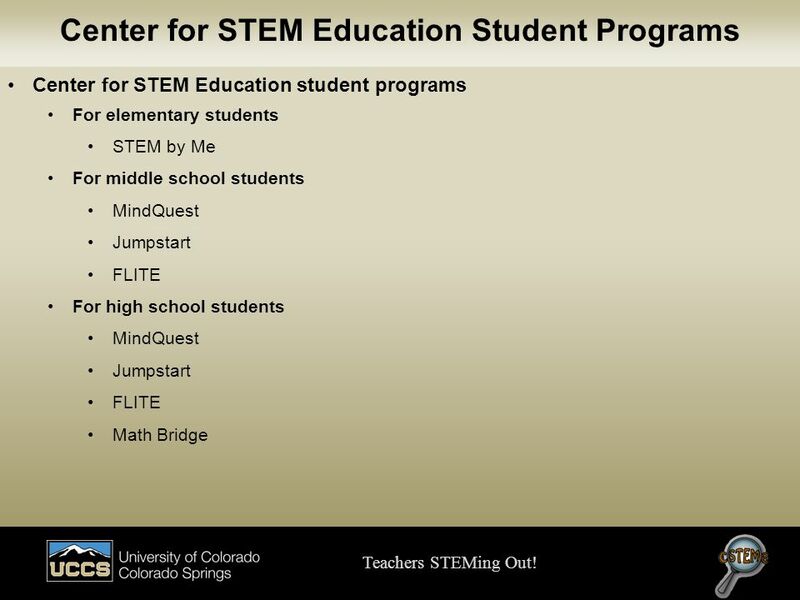 For elementary students STEM by Me For middle school students MindQuest Jumpstart FLITE For high school students Math Bridge Teachers STEMing Out! 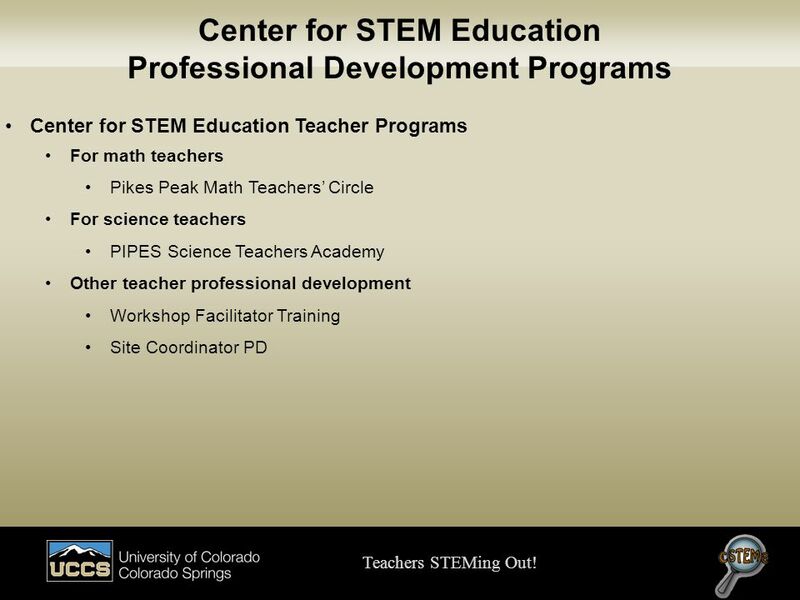 Center for STEM Education Teacher Programs For math teachers Pikes Peak Math Teachers’ Circle For science teachers PIPES Science Teachers Academy Other teacher professional development Workshop Facilitator Training Site Coordinator PD Teachers STEMing Out! 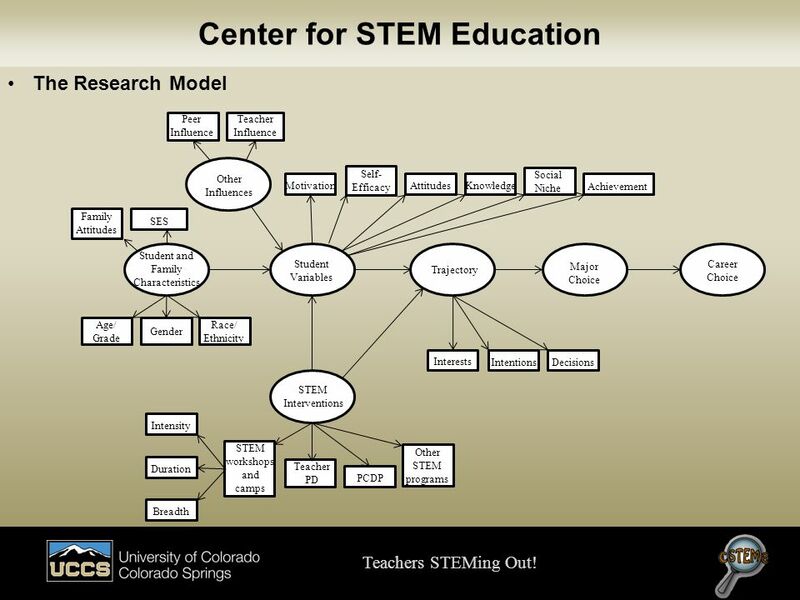 The Research Model Peer Influence Teacher Influence Other Influences Student and Family Characteristics Age/ Grade Gender Race/ Ethnicity Family Attitudes SES Motivation Self-Efficacy Attitudes Knowledge Social Niche Achievement Student Variables Trajectory Major Choice Career Choice Interests Intentions Decisions STEM Interventions STEM workshops and camps Teacher PD PCDP Intensity Duration Breadth Other STEM programs Teachers STEMing Out! The Collaboration Model Parents Psychology Department Education Department Biology Department Chemistry Department Engineering Department Mathematics Department Dissemination Peer-Reviewed Journals Conferences Educational Literature Grant Reports Internal Reports Research Program Development Student STEM Outreach Teacher Professional Development (PD) Industry Military Findings Curriculum Development External Program Evaluations External Curriculum Developments Relevant Literature Scientists, Mathematicians, and Engineers On-Site Programs Social/Behavioral Researchers Center for STEM Education School-Based Programs Educators Program Feedback Replication Sites Science Teacher PD Online Programs Pre-Collegiate Development Program School Districts Math Teacher PD Teachers STEMing Out! 10 Student Data/Results Teachers STEMing Out! 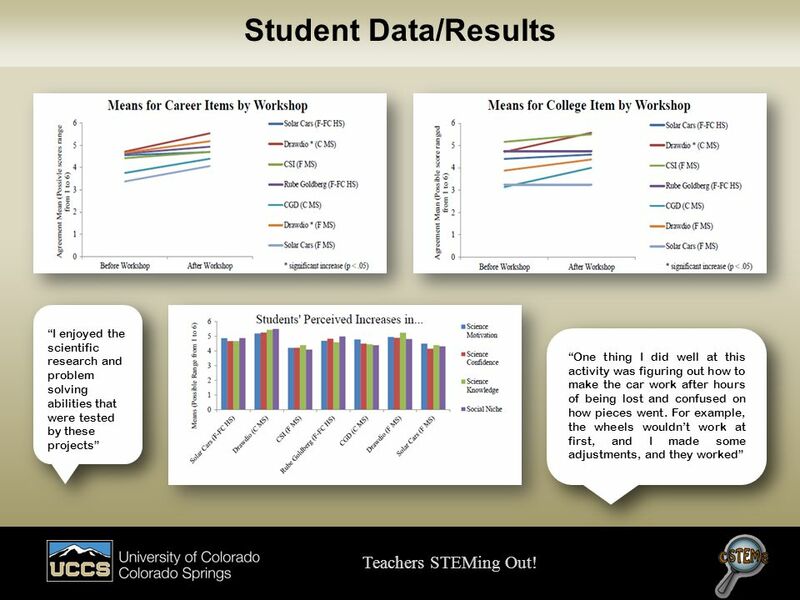 “I enjoyed the scientific research and problem solving abilities that were tested by these projects” “One thing I did well at this activity was figuring out how to make the car work after hours of being lost and confused on how pieces went. For example, the wheels wouldn’t work at first, and I made some adjustments, and they worked” Teachers STEMing Out! 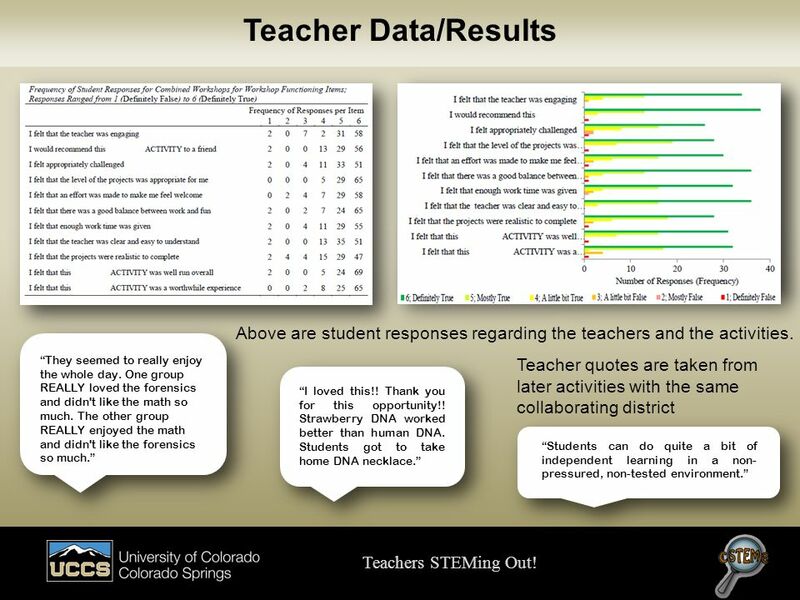 11 Teacher Data/Results Above are student responses regarding the teachers and the activities. Teacher quotes are taken from later activities with the same collaborating district “They seemed to really enjoy the whole day. One group REALLY loved the forensics and didn't like the math so much. The other group REALLY enjoyed the math and didn't like the forensics so much.” “I loved this!! Thank you for this opportunity!! Strawberry DNA worked better than human DNA. Students got to take home DNA necklace.” “Students can do quite a bit of independent learning in a non-pressured, non-tested environment.” Teachers STEMing Out! 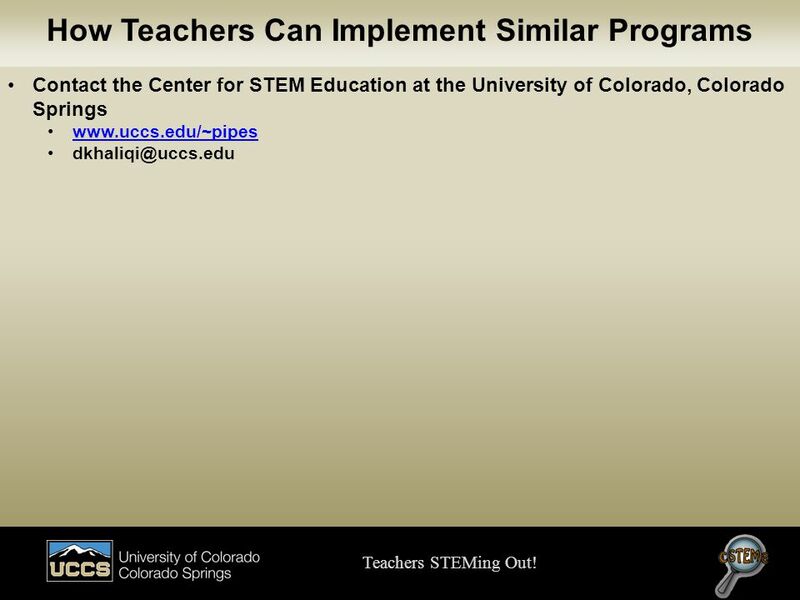 Contact the Center for STEM Education at the University of Colorado, Colorado Springs Teachers STEMing Out! Solar Cars Drawdio Crime Scene Investigation Rube Goldberg Computer Game Design Teachers STEMing Out! 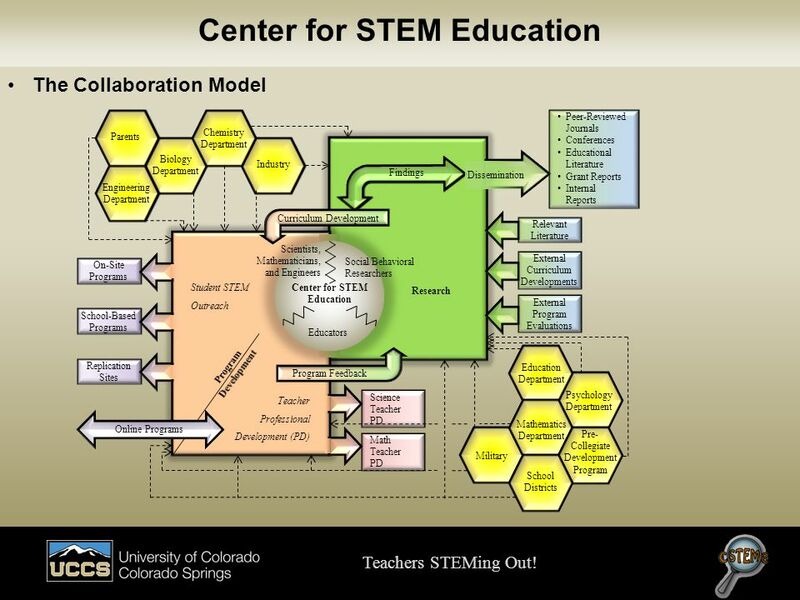 Download ppt "Center for STEM Education Also, Peter D. Marle and Lisa L. Decker"
Research and Impact The WaterBotics ® evaluation and research studies include two synergistic, but distinct, domains: educational impact and scale-up/sustainability. 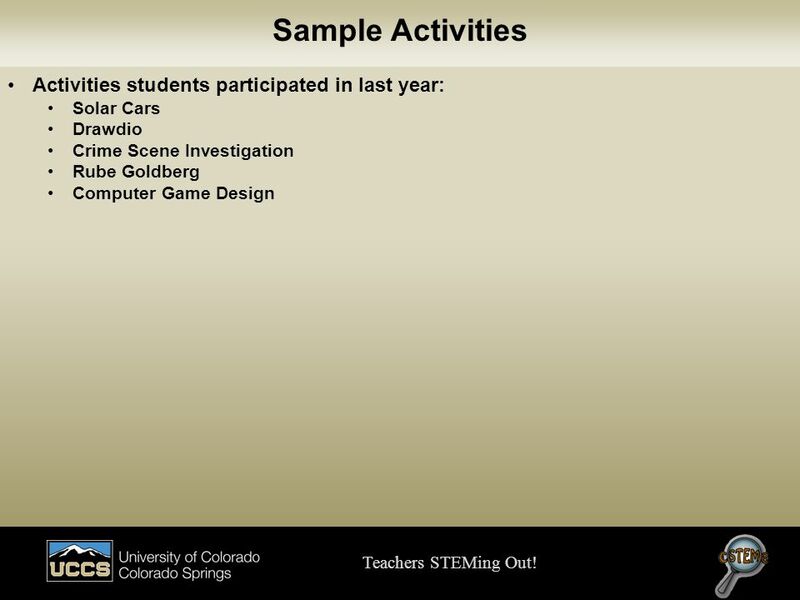 Math Teachers' Circles – Math Teachers' Circles – Themes from Final Surveys Diana White – joint with Brianna Donaldson and Adam Ruff University of Colorado. Research Experiences for Teachers (RET) in Engineering Program Engineering Education NSF Awardees Conference-Sept , 2007 Mary Poats, Program Manager-RET. 1 Marie Izquierdo & Pablo G. Ortiz. Prioritizing Tiered Support to Schools schools defined as “persistently low- achieving” by the requirements. UCA Institute for STEM Professional Development and Education Research. Materials Support Assessment Professional Development Community/ Administrative Involvement Curriculum Materials Science: It’s Elementary Bringing science. 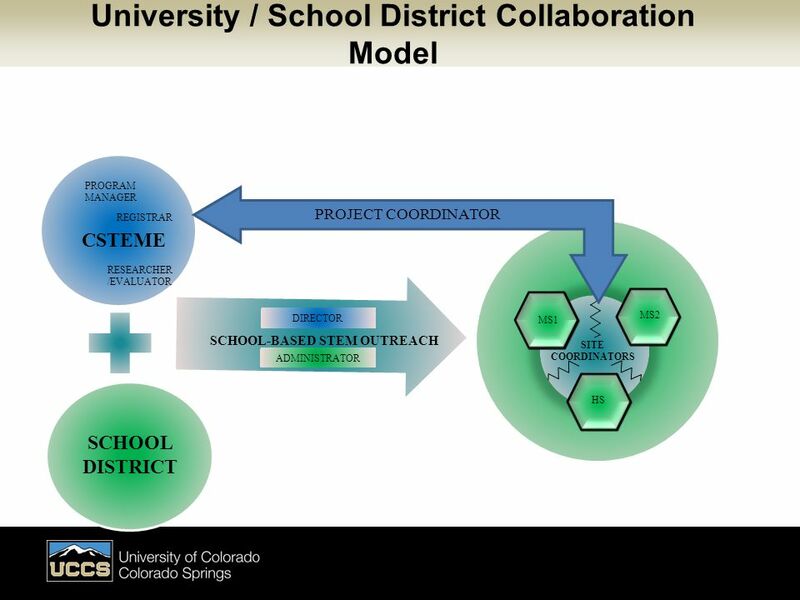 Lesson Study Races to the Top in Florida A Report on Lesson Study Initiatives In The Sunshine State Collaborate Plan Align Learn Motivate Share. Issues Surrounding the Evaluation of Teacher Internship Programs Donna Barrett Center for Education Integrating Science, Mathematics & Computing Georgia. Teachers for A New Era Neag School of Education Teacher Preparation Program’s Fall 2008 Common Entry Survey Results Teachers for A New Era (TNE) Teacher. Common Core Implementation Plan Whittier City School District Board of Education Meeting April 7, 2014. PISA Partnership to Improve Student Achievement through Real World Learning in Engineering, Science, Mathematics and Technology.